Just like all of the lights and electrical switches in your home are all part of the same power system – all of the plumbing fixtures and appliances are part of the same plumbing system. In fact, all of the waste from the bathroom plumbing goes to the same place as all of the waste from the kitchen plumbing. That place is the sewer line that is buried in the ground in your yard. If your sewer line fails – you could be faced with raw sewage and used water flooding your yard. Obviously, this situation is on a “worst nightmare” level when it comes to home improvement projects. However, the repair process can be really quite simple and efficient … if you know who to call! The Trenchless Guys have been providing expert trenchless sewer line bursting and pipe relining service to all Mount Vernon homeowners for more than 20 years! It used to be that a sewer line repair or replacement required hiring a plumbing company who had heavy equipment and could come in and dig large trenches throughout your yard to locate the pipe failure. This process was extremely damaging to landscaping, driveways, and even patios as the damaged pipe could be buried anywhere on the property. However, plumbing technology has advanced over the years and now there is a new option! The Trenchless Guys are proud to offer our clients to most advanced and efficient methods for sewer line repair. We have the specialized training and equipment to provide expert trenchless sewer line bursting and pipe relining – leaving your landscaping untouched! What Is The Difference Between Pipe Relining and Pipe Bursting? 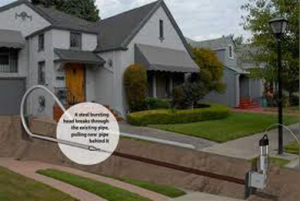 There are two basic methods for a trenchless approach to sewer line repair and replacement. These methods are: pipe relining and pipe bursting. Pipe relining is the process of adding a new layer inside the walls of the damaged pipe that will seal any cracks or fractures. The Trenchless Guys of Mount Vernon will carefully feed a flattened piece of material into the damaged pipe. Then, we use a sophisticated ballooning device to expand the flattened material until it meets the inside walls of the damaged pipe and adheres to form a strong seal. In most cases, this process leaves the integrity of the pipe more substantial that it was before. Pipe relining is perfect for pipes that have small cracks or fractures and are able to be repaired. If your pipes are beyond repair and must be replaced, The Trenchless Guys of Mount Vernon can add a whole new section of pipe – without digging – by using pipe bursting. With this method, our team will pulverize the old damaged section of pipe, while running a brand new section of pipe in its place. The new pipe is fully integrated into the plumbing system just as if it were the old section. Both of these expert trenchless sewer line bursting and pipe relining services are done without any digging at all! There is no need to worry about your yard or patio being destroyed. There is no need to be concerned with your sewer line repair or replacement taking weeks on end while the damage is being located. The Trenchless Guys of Mount Vernon can provide expert trenchless sewer line bursting and pipe relining to to get your sewer system back up and running!